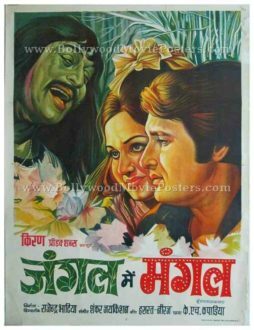 Old Bollywood movie poster of the Hindi film, Jangal Mein Mangal (1972) for sale. This is an actual surviving original vintage Bollywood movie poster of the 1972 Hindi film that featured Kiran Kumar and Reena Roy in lead roles. Printed and circulated during the original first release run of the film (early 1970s), this old hand painted Bollywood movie poster was originally designed for publicity of the film but never ended up being used. This old Bollywood movie poster was originally hand painted on canvas by a leading Bollywood poster design studio in Bombay. The design of this hand painted Bollywood movie poster has been inspired from the elements of nature, inline with the jungle theme of the film. This vintage Bollywood poster has been graded ★★★ Average mainly due to tattered borders. Overall in fantastic display condition and there is no significant difference in display quality of the poster from a viewing distance.